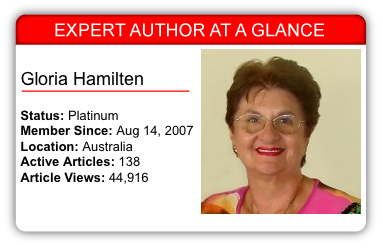 Today’s Expert Author Case Study introduces us to Expert Author Gloria Hamilten, co-founder of Life Mapping Mastery and professional life coach. Through her work as co-founder of Life Mapping Mastery, Gloria helps clients design their own Lifemap Blueprint. The business provides a service for personal and professional education using seminars, one-on-one coaching, group coaching, manuals, workbooks, CDs, DVDs, etc. Her programs are unique in that she helps people reach their potential, guiding them from start to finish with ongoing amendments to their Blueprint. Although her business focuses on life guidance, Gloria has expertise and a passion for a variety of other topics. She uses this passion to spark inspiration in her article writing. As part of our ongoing Expert Author Case Study project, we asked Gloria to share her thoughts on article writing and marketing. Because I am passionate about many areas, I write about a diversity of unrelated topics. This range includes professional development used in the corporate world such as “How to be a Successful and Empathetic Negotiator” and “Writing Business Reports that Everyone Will Want to Read.” I also write for the personal development market on skills to live an empowered, happy and fulfilling life. Another area I am passionate about is supplying parents with drug-free alternatives for raising a happy, well-adjusted child who has either ADHD symptoms or has been diagnosed with ADHD. Equally, I’m fascinated by how the brain functions and how we can look after it to serve us optimally into our centenary years. In addition, I integrate several modalities such as self-hypnosis, NLP [Neuro-Linguistic Programming], TFT [Thought Field Therapy] and hand reading in my arsenal to help people get over challenges in life. Have your reader in mind when you write an article. Ask yourself, “How will she or he benefit from what I have written? Will the article make a lasting impression?” That is the only way it can really be effective. Write from the heart. Write as though the person was sitting in front of you and you are having a conversation with each other. Just write what you are really passionate about and what can make a difference. It is so easy to be motivated when you love what you do. I love the people I write for although many of them I don’t know personally. However, I know that when someone reads what I have written, it was meant to be and that they will gain from it. I say that in all humility. Being passionate about what you do is the key to staying motivated. That’s also true in all parts of your life. Passion is what makes you want to keep honing your skills, to lifelong learning in your areas of interest. I feel inspired. All inspiration comes from the subconscious level and I have a very good relationship with my subconscious, we communicate all the time. You will probably laugh at that comment, but we are 90% subconscious mind and 10% conscious mind, so I like consulting both of them every day and most certainly when I want to be creative. It comes down to being passionate about what I write and having a deep respect for my readers. I live and breathe all the areas I mentioned in the first answer. Apart from articles, I have also written eBooks and had two physical books published with others ready to go. What also helps is that I love to write and therefore it comes relatively easy. I believe everything we do and do well comes from our mental attitude. If I believe I’ll have writer’s block, I will. If I believe I won’t have writer’s block, I won’t. That goes for everything in our life. I have received a lot of traffic from having articles published on EzineArticles. Traffic keeps coming even months after I’ve had an article published. It’s an excellent way of getting global exposure on an ongoing basis. I have started a new business called Life Mapping Mastery which is really a rebranding and amalgamation of other like businesses I have, and I’ll be using EzineArticles as a significant part of my marketing strategy. I like the ethical and consistent standard that makes this form of marketing creditable. Actually all the tools are beneficial. I suppose my favourites would be View My Article Reports, Create a Widget (I love that on my site), Article Promotion and Title Suggestions. I like the way that you send reminders and ‘How To …’ emails on using the tools. With reference to EzineArticles, I would say read up on all the training that is on the website. With reference to life in general, I would not let anyone attempt to distinguish the flame of passion inside me for what I want to do. We all know what we want to do in life, but we let others influence us with their well-meant but misguided wisdom. We need to let our light shine and that is done through self-expressions and self-actualisation. That is what I teach today: how to find your passion, live your life with purpose, be true to your values, utilise your strengths, breakthrough barriers, design your life’s blueprint and then, LIVE IT. As I said above, read up on all the training material that is on the websites of the various article publishers. I started with wild enthusiasm to just have articles published without looking at all the tools that are available. If you want to write, then “just do it.” If your grammar is not up to scratch, still write but have someone proofread it. Don’t let that stop you. When your heart and soul are on a mission, they should never be stopped. Learn ways to improve your writing style and writing skills as you go. And above all, never become disillusioned or despondent. That is, never give up. You will succeed if you persevere. Just write one article at a time so as not to get overwhelmed. First of all, I’d like to mention what a great service EzineArticles provides us authors. We not only get to do what we love (write), but we also get to reach a large audience whom we can help. The service and integrity of this company is magnificent – and it’s free. The other thing I’d like to share is that every day I experience the miracle of people. If only everyone would realise what unlimited potential they have. If only they would let self-doubt, fear and guilt permanently leave their decision-making. If only they would realise that whoever they believe to be their creator made no mistake with them when they were born, that they took on limiting beliefs from their traditions and upbringing that no longer serve them, every person on this planet would live the life of their dreams. There is abundance if we just look for it, are willing to work for it and we respect each other. Always have your reader in mind when writing, and write as though you were having a conversation with them. Motivation comes from within. It will always be there if you are passionate about what you are writing. Embrace your subconscious mind in your daily tasks. After all, it houses all your values, beliefs, attitudes, memories, past decisions that you’ve made, and the preferred language that you use. Read a lot and expand your internal and external horizons. When starting out just take one small step at a time until you feel you can take larger steps and speed things up. Whatever you do NEVER, ever give up. Believe in yourself. That’s very important especially when others may pull your work down. Try at least one of these today when you submit your next set of quality, original articles. Leave a comment to share your own thoughts and insights with Gloria. 1) Do you place articles on any other ezine sites as well? And if so, do you use the same articles or rewrite them to be unique for each site? 2) Do you place articles on your own website? And if so, do you use the same articles as here or rewrite them to be unique? get a different crowd if the one you are with are in the same boat you are in. Thanks for the info. I had never looked at the widgets tool before. That’s a great tip. I do place articles on other sites, but not as diligently as on EzineArticles. Each article site has its own requirements so it is necessary to change articles slightly. I do prefer to give some new content within each article as with RSS feeds and some clients who are subscribers to my multiple blogs and sites, out of respect them them, I like to vary the content. Also, I can be more conversational when writing on my sites. Here and on other article publishers, the writing has to be more formal. My priority is to place articles on my websites and blogs, as my priority are my clients and visitors to my sites. Yes, I do start each day anew. I take with me learnings from the previous day to improve, and start each day with a fresh, updated mindset. I also thank for each new, magnificent day and all that it will bring. You’re welcome re: information. The EzineArticles site is great to explore – lots of handy tips and things. Congratulations on your Championship wins. Definitely a great article. Its inspired me and got me back on track. What a wonderful interview. I found it very inspiring as I feel the same drive to see people doing what they love to do. I can see from your blog that we have similar values – wonderful saying and video on your blog. I’ve left you a comment. Way to go Gloria. Sometimes its good to get inspried by other people (regardless of who they are) to keep them motivated. Sometimes its so easy to go off track and your passions are sidelined, or put on hold (as I get like now). So its back to my first article which I’ve started but haven’t finished. Its a big one because it involves setting up a website, getting information (mountains of it) and contacting key people. I’ve thought of putting it on hold and starting a smaller article which I think is the best choice. What would you say ? Keep up the good work. We really need people like you who knows what she is doing. You serve as an inspiration to all of us struggling to share something to the world. Keep on sharing your wisdom and making a difference. These very words you said…. “We let others influence us with their well-meant but misguided wisdom”, is the major cause why many people have not discovered their strengths and passions and hone their skills. Most are afraid of being ridiculed, criticized etc. I believe each of us have been given a talent waiting to be discovered. I keep a list of sayings by those who have failed to inspire me to persevere. “Only those who dare to fail greatly can achieve greatly”. Thank you for the excellent writeup I got from EzineArticles. Absolutely loved the interviews. I greatly agree with your thoughts and i also write about things which i am truly passionate about. I liked the positive energy that emanated from this interview and has given me a new perspective and vigor to start my day. I also did not know about the widgets. Thank you for the useful tip. Nice interview! You offer good advice & it is like a breath of fresh air to hear of your positive attitude and passion. Thanks for the info. I place articles on my blogs. What a fire you have! Thank you for the encouragement to be who we are. And indeed, the creative juice lies in our unconscious (as do some other things) and better we use this asset productively and joyfully. Using our talents and gifts honors who we really are. I see it every day in my clients and in myself, too. And, by the way, no Chardonnay has ever tasted better to me than those from Australia! Great article, I can just feel the good energy coming through it! I especially liked the reminder to pay attention to your unconscious mind. That’s a great article you wrote. I enjoyed the positive messages. I believe much of what you say as it has been part of my thinking for many decades. I do, however, believe that much of our inspiration comes from a higher power not just our subconscious. Sometimes, definitely, our thoughts are triggered from our subconscious, but sometimes a thought can be true inspiration and when we act on that thought, good things flow. Good results happen — after a lot of hard work. I write at Hubpages and enjoy other hobbies, too, so I try to really balance things out even though writing is my first language. Keep up the energy level. It’s nice to have come across your writing. Hi Gloria! I loved your article! Like you, I also have many different interests, and sometimes I find it hard to not feel pulled in many directions. I am inspired by the fact that you have been able to do justice to all of your interests and make it work for you. Do you have any tips on how you did this, without being overwhelmed? Thank you so much for the great aricle and inspiration! Sorry for the delay in replying, I only just noticed that I hadn’t replied to some lovely comments. These are generalisations which you can adapt to your circumstances. illusion that is the past and the future. What amazing, supportive people you all are. You are all truly very special and I’m humbled by your kindness in giving me, a stranger, such support and encouragement. I loved every response and I can see that we are like-minded people who give of our best in the pursuit of helping others and are cognicent of our own evolution to lead our own fulfillling life. I laughed when I read Mary’s comment about Chardonnay in Australia. Yes, we do love our wines here, and we do have some excellent vinyards. Pamela, thank you for your comment re: the subconscious mind. I wish you all a most magical and joyful life filled with love, inspiration and wellbeing. Re: “other submit sites and rewrites”. I do submit articles to other article publishers but not as reularly as I do in EzineArticles. Does that answer your question? If not, just let me know. Your response to LP Morgan begs the question for me: Why do you primarily select to post in EzineArticles and which specific other article publishers do you choose & why them? Sorry it has taken so long to reply to you, I only just noticed that you had asked me a question. There really is no logical reason. I’m familiar with EzineArticles and its proces. It’s one of the largest if not the largest article distributor. I don’t spend a lot of time publishing articles, it’s just one of my tools to market what I do. I am so happy to read someone who also believes you can contribute to your brain health with your lifestyle. No doubt about it. Lifestyle is crucial to brain development, good health, in short, a person’s total physical, mental and spiritual wellbeing. Since I read your Ezine article(s) August, 2010, I have been thinking positively about contributing to EzineArticles.com also. I just got my expert author status! Congratuatulations B. Todish, that is wonderful. I hope you gave yourself a reward for that accomplishement and for writing articles. Rewards are an essential ingredient to boost our self-esteem.